We are proud to help Cheryl and wish her much success now and in the future. Our “High Hopes” Gala will be held on September 27, 2014 at the Lake Mary Marriott! We hope you’ll help by joining us and spreading the word to your family and friends, too! 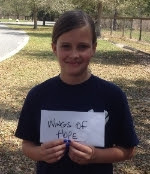 For information about Sponsor Opportunities and event details, visit our website at www.wingsofhope.net/events.